This illustration depicts a French poilu in full gear. 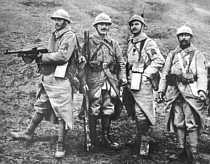 These French front-line troopers sport the latest in weapons including a light machine gun and grenade launcher (1918). A Tommy in complete front-line uniform including sheepskin vest (1915). Typical British gear inluding rifle, gas mask and helmet. Each soldier was expected to carry this 70 pounds of equipment into battle. 23 Sept. 1915, Very wet day. I bombarded Huns' wire. Other platoons of 'B' Company went into trenches. No. 7 into trenches. Very muddy & wet! 25 Sept. Very wet night. Bombarded wire "8/62"
officer & I Cpl. killed. Very wet night! Very tired. as English officer. Cold night but fine. our wire! 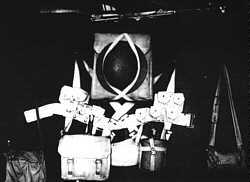 Huns "wind up" at 4.20 a.m.
29 Sept. Relieved & came to Souastre. Nice billet. since I left England. Had bath! Hebuterne - awful thing! Slept at "Poste Cambron"
with me. Rats & mice in dug-out; crawled over me! RFA to tea & lunch, I had lunch early tho'. Lilian sent me a lavender bag. us, on left corner of trench. Geman infantry uniform early in the war before the decorative pickhaube helmet was replaced with a more functional and protective design (1914). Geman infantry uniform as of 1916 includes the protective metal helmet. 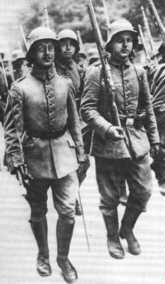 German infantry in the 1914 uniforms near the start of the war. 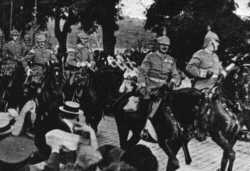 Geman Uhlans (cavalry) leaving Berlin. Note the cheering crowd (1914). 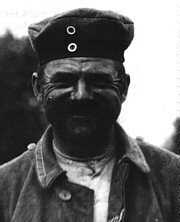 POW or not, this German is happy to have survived. For him, the war is over (1918).